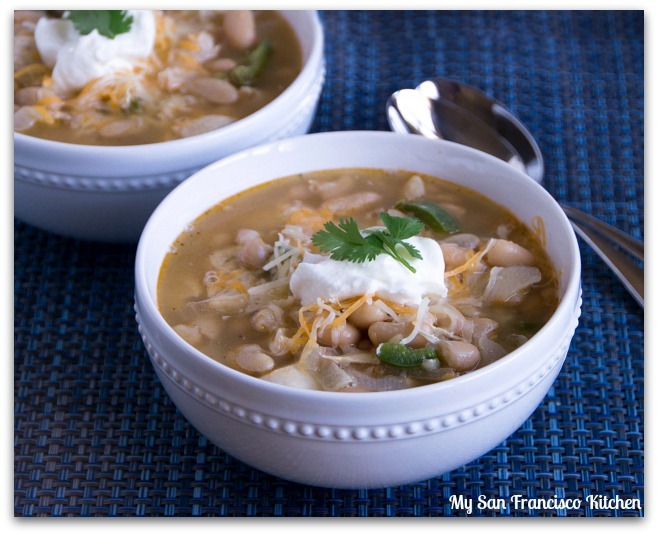 Rainy days call for…white chicken chili! It has been raining in San Francisco for the past 3 days, which is a nice change from the sunny weather we have been having for the past few months and California definitely needs some rain. At the same time, whenever it rains I get incredibly lazy. I don’t feel like doing anything but hiding under a blanket on my couch watching a TV show marathon or a few movies all day. Oh, and don’t let me forget the nice warm bowl of soup or chili! This white chicken chili is really easy to make in a slow cooker, and the perfect comfort food on a cold, rainy day. My favorite part about it is the toppings – cheese, sour cream, and cilantro, yum! For the full recipe, head over to Stepable.com. 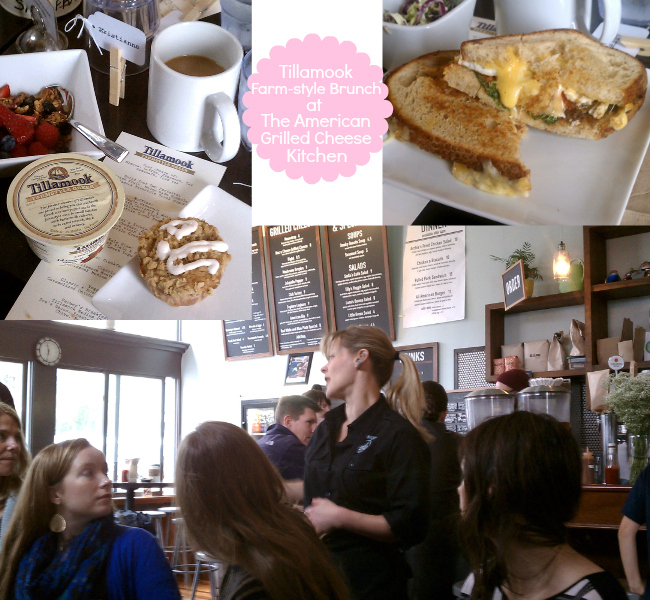 I actually did go out in the rain earlier today to a farm-style brunch hosted by Tillamook at The American Grilled Cheese Kitchen in the mission district in SF in celebration of Tillamook’s delicious line of yogurts that are trickling into grocery stores. I already LOVE Tillamook ice cream and cheese, so I was so excited to try their yogurt flavors! I wasn’t surprised at how creamy and incredible it was when I had some for brunch this morning with a bowl of fruit and granola. I tried the cinnamon hazelnut flavor, and it is now my new favorite!! It was great seeing familiar faces of fellow food bloggers, and meeting some new friends. Among the group were Kelly from SodaPop PR, Jeanne from Shop Sweet Things, Claudia from Unknown Mami, Jennifer from Peanut Butter and Peppers, Angela from Refinery29, Azmina from Lawyer Loves Lunch, Lisa from Authentic Suburban Gourmet, Anna from PopSugarFood, & Kimberly from Bake.Love.Give. I had the classic breakfast sandwich, with some extras added in (arugula, roasted tomatoes, onion). Heidi and Nate (the owners) are the sweetest! Heidi made us these incredible apple cinnamon and pumpkin muffins using Tillamook’s yogurts, and gave us some tips. Those muffins alone were enough to make me go back again! There is nothing like the best grilled cheese sandwich in San Francisco in the world to get you out of the house on a rainy day! This entry was posted in American, Dinner, Lunch, Soups and tagged beans, cheese, chicken, chili, cilantro, kidney beans, slow cooker, sour cream. It was such a pleasure to finally meet you today! I absolutely love your blog and I think you are such a sweet person! I totally had a blast today and oh my gosh, best grilled cheese sandwich, hands down!!! And Tillamook Yogurt, I hate to say it, but it’s my new favorite! I had the vanilla and it tasted so good, but I tried my Husbands Coffee flavor and man that was the best! The coffee is my new favorite, however I haven’t tried the cinnamon hazelnut yogurt yet, but can’t wait to try it!! Your white chicken chili is perfect for this rainy weather!! I am going to check out your recipe. I have been in the mood for chili and love that you used chicken instead of beef! We’d kill for rain! We’ve been getting snow instead. 🙁 But rain — or snow! — does call for chili. Good recipe — thanks. So great about the rain, it’s been raining all weekend here too which is desperately needed! The brunch looks great, how fun! This chili looks great, I’ve been craving a hot bowl of this!